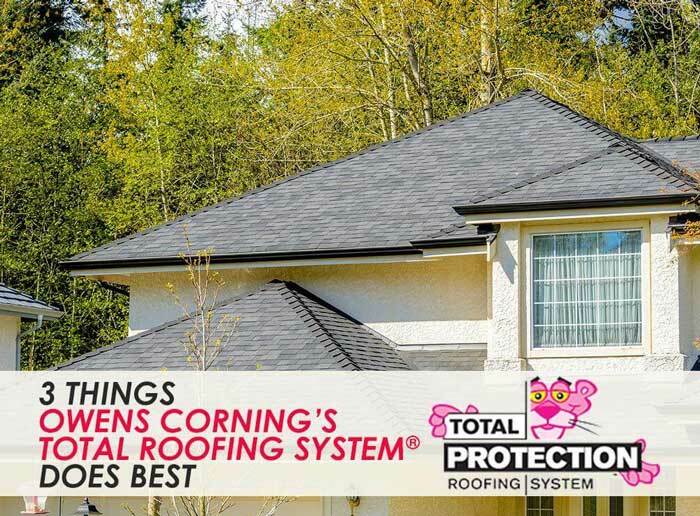 Owens Corning’s Total Roofing System® has one of the aptest names in the business. Equipped with innovative components, it delivers an all-around performance to protect your home in the most critical areas. This premier roofing system waterproofs homes like no other. From wind-driven rains to ice dams, it covers the wooden roof deck with advanced underlayments. It has reliable barriers installed in the vulnerable areas, such as valleys and vents, to prevent rot, mold, and other causes for concern when the water manages to penetrate the shingles. A properly sealed roof is a reliable one. As a certified contractor, count on us to install Owens Corning’s underlayment and water and ice barrier products to perfection. With great attention to detail, you can rest assured that your home remains dry and intact even when your shingles fail. The Total Roofing System has a formidable first layer of defense. It has state-of-the-art starter shingles that keep blow-off and water infiltration to a minimum. The star of the roofing system, the TruDefinition® Shingles, feature the patented SureNail® Technology that helps keep them in place no matter what. Apart from providing an attractive finishing touch, hip and ridge shingles improve the Total Roofing System’s resistance to the elements. Other than outdoor threats, the Total Roofing System also deals with excessive heat. It has cutting-edge intake and exhaust vents for optimal air circulation beneath the deck. Experienced roofing contractors would attest that adequate attic ventilation is critical to roof health. Owens Corning’s well-designed vents don’t just prevent deck deterioration and mold growth, but they also discourage ice damming. The Total Roofing System is the perfect roof for Detroit homes. To schedule your FREE, in-home consultation and get an estimate for your re-roofing project, call Kroll Construction today at (888) 338-6340.